Director: Alfonso Cuarón. Cast: Yalitza Aparicio, Marina de Tavira, Nancy García García, Marco Graf, Diego Cortina Autrey, Carlos Peralta, Daniela Demesa, Fernando Grediaga, Jorge Antonio Guerrero, Verónica García, Andy Cortés, José Manuel Guerrero Mendoza, Zarela Lizbeth Chinolla Arellano. Screenplay: Alfonso Cuarón. Twitter Capsule: Cuarón's a prodigy of world-building. Strains a bit more at characterization. All holds true in this textured memory-play. 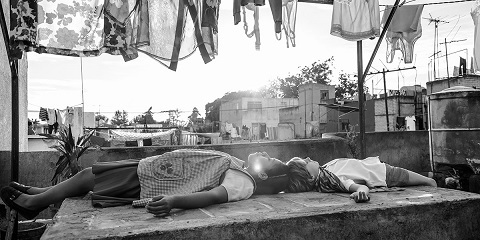 Second Capsule: Call me old-fashioned, but the fact that few people will see Roma's astonishing recreation of mid-70s Mexico City on a big screen is so sad. VOR: ⑤ Every aspect is unusual and jaw-droppingly ambitious, from subject to execution. Cuarón plays to formidable strengths and test himself in new ways.